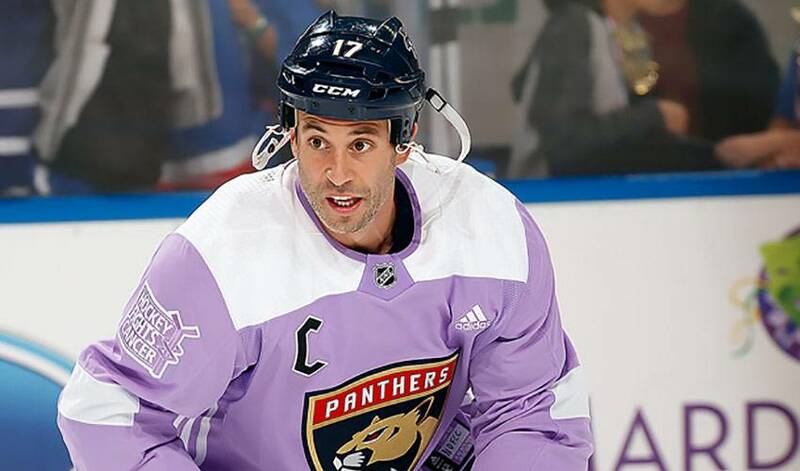 Derek MacKenzie has seen the smiles time and again, the ones he never expects to see, but is always moved by every time he does. During the month of November, those thoughts take on extra meaning. Hockey Fights Cancer, a joint initiative between the NHLPA and NHL as well as a program of the National Hockey League Foundation and NHL Foundation, launched its annual campaign on November 1. Uniting the hockey community in support of cancer patients and their families, the initiative will feature ceremonies, observances, and fundraising efforts throughout the month of November, with participation of all 31 Member Clubs and players. For MacKenzie, it prompted remembrances of how his bond with NOFCC began. NOFCC was established in 1998 by a group of parents of children battling cancer. The parents were seeking to provide assistance and support to families, which wasn’t available through other programs. The organization serves families who have been touched by childhood cancer-families with a child on active treatment, those off treatment or receiving follow up care, and bereaved families. Through several programs, NOFCC also helps the families with some of their immediate needs. “I was approached by a couple of friends back home to do a charity golf tournament and it was right around the time I was with the Columbus Blue Jackets,” recalled MacKenzie, a native of Sudbury, Ontario. “We were doing some work with a charity called Hats for Heroes (founded in 2000 to support the fight against pediatric cancer). I tried to participate in as many events as I could. It has been exactly that for both MacKenzie and NOFCC. It’s a big reason behind MacKenzie’s decision to get his children involved with both the NOFCC and the annual golf tournament he holds each summer in Sudbury to raise money and awareness for the organization. “They’ve started coming out with me to events,” he said. “Whether it’s my daughter (Reese) on the day of an event coming out and helping, or on the day of the golf tournament, my son (Greyson) will spend time out on the course and we usually bring one of the kids out to play a few holes – I think it’s important. Through his efforts as an ambassador for the NHLPA’s Goals & Dreams Fund, the largest grassroots hockey assistance program in the world, MacKenzie has also been able to share his love of hockey with NOFCC. In 2014, MacKenzie and Goals & Dreams teamed up to distribute new sets of hockey equipment for diagnosed children and their siblings. In the first round of Goals & Dreams distributions for the 2017-18 hockey season, NOFCC will receive 15 new sets of equipment. It’s a perfect example, said MacKenzie, of how hockey brings people together. “It sure does,” he offered. “It’s nice to know if they’ve outgrown equipment or need new hockey gear, they can have that. To be able to get them back on the ice, or just them having the thought of that stuff sitting there, waiting for the day that they are cleared to get back to playing hockey – it makes a huge difference in their lives. That’s what MacKenzie continues to do, guided by NOFCC’s vision: That every child and family affected with childhood cancer enjoys the best quality of life possible, from the time of diagnosis, through to the completion of treatment and beyond. A thought that always puts a smile on his face.